The Arkansas gubernatorial election of 1984 was held on November 6, 1984. Incumbent Governor Bill Clinton won reelection with a 25% margin of victory over Jonesboro businessman Woody Freeman. This was the last gubernatorial election in Arkansas before the implementation of Amendment 63, lengthening the term of the governor of Arkansas from two to four years. Winning his third of five terms as Governor of Arkansas, Clinton continued to serve this office until shortly after he was elected to the presidency in 1992. 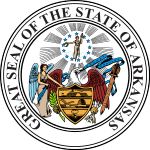 ^ "Constitution Of The State Of Arkansas Of 1874 AMENDMENTS TO THE CONSTITUTION OF ARKANSAS OF 1874" (PDF). sos.arkansas.gov. Archived from the original (PDF) on 2016-08-09. Retrieved 12 November 2012. ^ "AR Governor - D Primary". ourcampaigns.com. Retrieved September 26, 2010. ^ "AR Governor - R Primary". ourcampaigns.com. Retrieved December 9, 2006. ^ "Bill Clinton Political Career". cnn.com. Retrieved 22 January 2019. ^ "1984 Governor's Race". clintonhousemuseum.com. December 11, 2012. ^ "Remarks at a Reagan-Bush Rally in Little Rock, Arkansas". utexas.edu. Archived from the original on 22 June 2011. Retrieved 22 January 2019. This page was last edited on 2 April 2019, at 09:11 (UTC).